Valentine Candy Gift Basket. 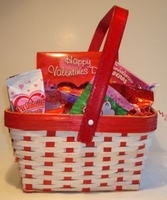 A medium size red and white wicker basket filled with a variety of chocolate Valentine candy, heart shaped suckers and fruit snacks. You will find a 1.76 boxed chocolate heart, Russell Stover 1.25 oz peanut butter heart , Reese's peanut butter heart, marshmallow heart, heart shaped fruit snacks, 1 oz box of conversation hearts just to name a few heart candies.